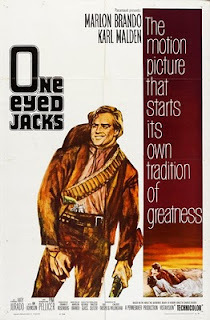 Marlon Brando takes his one and only turn in the director’s chair with uninspiring results in the 1961 Western character study One Eyed Jacks. Not surprisingly, he stars in the film as well, once again opposite Karl Malden. The two actors play a pair of gringo bandits running amuck somewhere in Sonora. They knock over one bank too many before being trapped by the Mexican rurales atop a dusty, wind-swept ridge. A shoeless Malden flees upon their only horse in an effort to secure fresh mounts, but instead high tails it with the loot and leaves Brando to suffer a five-year prison sentence. This is quite a long film at two hours and twenty minutes, yet the action described above takes place in the first few scenes. The remaining two hours cover events following Brando’s escape from prison — how he searches for Malden in hopes of revenge, to eventually find him employed as a sheriff in some idyllic town on the California peninsula. One Eyed Jacks is an overlong film that suffers greatly from having an auspicious beginning that the rest of the film doesn’t live up to. It’s difficult to care very much about this cast of characters — something Brando seemed to realize. He repeatedly goes out of his way to show himself doing one good deed or another (which usually means protecting a girl from some whisky-sodden stumblebum) in an effort to win viewers over, but in the end we are just left with the awkwardness of trying to accept his brooding, mumbling, needs-to-break-free screen persona in the wide open spaces of the west — he just doesn’t fit. The are a half-dozen subplots going on, each a well-worn cliché: Brando allies himself with some banditos who turn out to be much worse than he realized, he falls in love with Malden’s beautiful Mexican stepdaughter, he busts out of jail, narrowly dodges a hanging, and so forth. The film’s two brightest spots come from its cast, in the form of Katy Jurado and Slim Pickens. Jurado plays Malden’s wife, and she offers a welcome sense of calmness and assured professionalism in an otherwise clumsy film. Pickens is just, well, Pickens — always an asset to any film he’s in. I streamed this through Watch Instantly on Netflix. The quality of the transfer is horrendous and not worth your time. I share this in acknowledgment that it can be very difficult to enjoy, or at least appreciate a film one hasn’t been viewed under the appropriate circumstances. I haven’t seen the print on the commercial DVD but it has to make for a better experience than I had streaming.